I thought it very timely to visit this issue at this time. Have you noticed that everywhere you go, someone is sneezing, coughing, catarrh, wheezing, croaking with a very bad sore throat, running a mild fever etc. A visit to the pharmacy gave me the extent of the prevalence and our dependence of drugs for issues we can at least treat quite well using natural remedies. Most of the pharmacies had run out of drugs for flu, cough and cold ! So in such situation, we can allow nature to give a little helping hand. The truth is that, if you have been eating well and healthy, a little drop in your immunity would allow these symptoms to come up. But at the same time, unless you have seen your doctor and it is clear that you need help, your body , well assisted, would soon build up your immunity, and you soon overcome. Please note that this does not say that you should not see your doctor. That should be your first line of thought, if you k now that it seems a bit over the edge for you. It may be ‘just a cold,’ but it’s nothing to sneeze at. And the flu can make you feel downright drained. Fortunately, fast action on your part including these simple home remedies for colds and flu can mitigate the misery. Is it a common cold or the flu? If your symptoms are above the neck congestion, sore throat, sneezing, coughing you probably have a cold. If you have all those symptoms plus a fever of 38.8ûC (102ûF) or more, headache, muscle aches, extreme fatigue, diarrhea, nausea or vomiting, you are more likely to have the flu. People with a depressed immune system or nutrient deficiencies may be more prone to catching colds. Also, common causes of catching a cold include: lack of sleep, emotional stress, mold exposure, unhealthy digestive tract and traveling. The good news is there are plenty of natural head cold remedies to help you kick your symptoms fast! 1. Bone Broth – Contains amino acids and minerals that naturally support immunity. Consume soup made of real bone broth and vegetables. 2. Water – Adequate hydration is the key to flushing out the virus from your system. Try to drink at least 8 ounces every 2 hours. 3. Hot water with lemon, honey, and cinnamon – Helps prevent mucus buildup and keeps you hydrated. 4. Ginger – Make a ginger tea and add raw honey. 5. Garlic and onions – Both of these vegetable help boost immune function and have antibacterial and antiviral properties from a compound they contain allicin. • Sugar – Decreases white blood cells that help fight off infection. • Fruit juices – Although orange juice contains some vitamin C, it is not as high in vitamin C as whole fruits or vegetables. If you want to drink juice, dilute it. • Conventional Dairy – Pasteurized milk and other dairy products are mucus producing. • Fast Food – “Empty calories” that have no nutrients for supporting your immune system and are toxic to the body. • Processed grains – Breads, pastas, cereals, wheat products, and white flour products quickly turn into sugar and weaken immunity. For a sore throat remedy, fill a 250 mL glass with warm water, mix in one teaspoon of salt and gargle away. The salt really does soothe the pain. Add a squeeze of lemon juice to a glass of warm water for the more traditional sore throat gargle. This creates an acidic environment that’s hostile to bacteria and viruses. •Drink as much water as you can eight or more 250 mL glasses to keep mucous membranes moist and to help relieve dry eyes and other common flu symptoms. Fluids also help thin mucus so that it’s easier to expel. 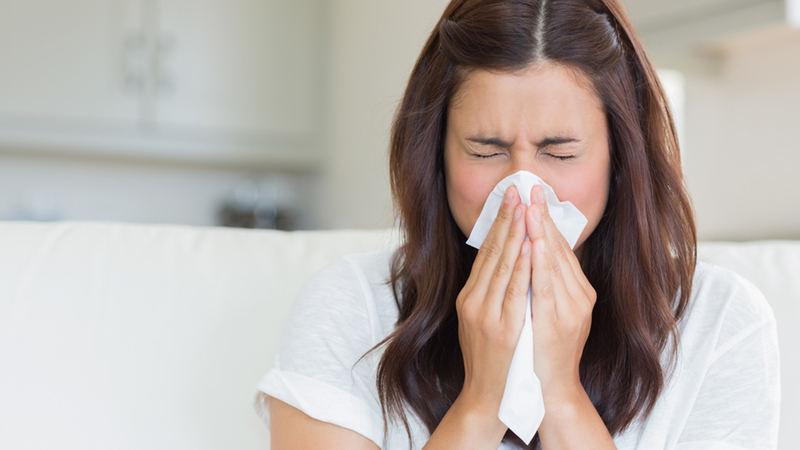 To help keep mucus loose, stay in a moist, warm, well-ventilated room. To keep the air in your bedroom moist, place bowls of water near the air ducts or run a humidifier. •Cut short your cold with a warm blowing air. . As outlandish as it sounds, inhaling heated air may help kill a virus working its way up your nose. Try soaking your feet in a mustard footbath. In a basin, mix 1 tablespoon of mustard powder in 1 L of hot water. The mustard draws blood to your feet, which helps to relieve congestion. •Another oldie: try a mustard plaster for chest congestion. Grind up three tablespoons of mustard seeds, add water to make a paste, and then slather it on your chest. The pungent aroma helps to unclog stuffy sinuses, while the heat improves blood circulation and eases congestion. Don’t leave the plaster on for more than 15 minutes, however, or your skin may burn. You may want to smear on a bit of petroleum jelly before you apply the plaster to protect the skin. •Breathe easy with steam. Please take care while using hot water during this process. Pour just-boiled water into a large bowl. Drape a towel over the top of your head to trap the steam, and breathe in through your nose for five to 10 minutes. Don’t lower your face too close to the water or you risk scalding your skin or inhaling vapours that are too hot. To make steam inhalations more effective, add five to 10 drops thyme oil or eucalyptus oil to the water. Keep your eyes closed as you breathe in the steam, since both essential oils and steam may irritate your eyes. On the go. Dab a few tissues with eucalyptus oil and hold them under your nose whenever you feel congested. Eucalyptus essential oil can open up the sinuses and lungs helping heal a cold fast. Frankincense essential oil naturally boosts the immune system and oils of oregano and clove are anti-bacterial and anti-viral which can help you kick a cold. As soon as you notice cold or flu symptoms, start taking 500 mg of vitamin C four to six times a day. If you develop diarrhea, cut down on the dose. Goldenseal stimulates the immune system and has germ-fighting compounds that can kill viruses. As soon as you begin to feel sick, take 125 mg five times a day for five days. At the first sign of the flu, take 20 to 30 drops of elderberry tincture three or four times daily for three days. Elderberry is widely used to fight viruses. A dose of garlic’a natural antiseptic‘will do a job on those viruses. If you’re feeling very brave, hold a small clove or a half-clove of garlic in your mouth and breathe the fumes into your throat and lungs. If it gets too strong as the clove softens, just chew if up quickly into smaller pieces and swallow with water. For a serious congestion-busting blast, buy fresh horseradish or gingerroot, grate it and eat a small amount. To guard against upset stomach, wait until after a meal to try this. •Drink a cup of ginger tea. Ginger helps block the production of substances that cause bronchial congestion and stuffiness, and it contains compounds call gingerols, which are natural cough suppressants. ‘ During cold and flu season, take 20 to 30 drops of Echinacea tincture in half-cup of water three times daily. Most of the time, if your immune system is strong and if you get enough rest or fluids, colds will go away on their own. Many people actually feel better after their cold has been resolved than they did before they got sick, as the pathogen stimulates the immune system and toxins are eliminated. • Increase your water intake. and a sprinkle of cayenne pepper. (Cayenne pepper is very warming and rich in Vitamin C.
There are a few remedies, that are as good as ever , and works wonderfully in alleviating your condition. A well-known immune system strengthener, garlic shines as an antibacterial and antiviral herb for fighting colds, coughs and the flu. One of the best ways to take advantage of garlic’s healing properties is by drinking fresh garlic tea. Sweetened with a little raw honey, it’s delicious and helps to heal what ails you. Peel 2 to 3 cloves of fresh garlic and lightly crush them with the side of a wide knife blade. Add them to 2 cups of water and bring to a boil. Lower the heat and simmer for another 15 minutes. Strain the garlic and allow the tea to cool to mouth temperature. Add raw honey, a tiny pinch of cayenne pepper and a squeeze of lemon juice. Drink as much as desired. A mixture of fresh lemon juice and raw honey provides soothing relief for sore throats and helps stop the tickle that stimulates coughing. Raw honey — with all its components including royal jelly, propolis and bee pollen — is high in nutrients and enzymes which kill bacteria and viruses. The vitamin C and antioxidants found in fresh lemons boost the immune system, speeding healing. Together these two home remedies are a powerhouse for getting over a cold and sore throat. Mix the juice of 1/2 the lemon with 2 to 3 tablespoons of honey and sip throughout the day as needed.